The city of Manchester is synonymous with new bands. So much so that they almost seem to blend together into one giant mould, with everything, quite frankly, sounding the same. Step forward ‘The Steak Baguettes’ - a band of quite a different variety. Their first EP ‘The Joke That Went Too Far’ was released just before Christmas, and now the group are currently creating their new album named ‘That’s Gotta Be’ (working title) with production by Retro Sound Studios. 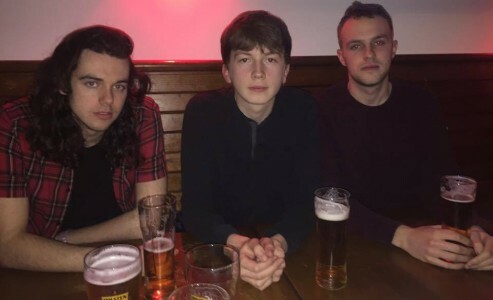 There are five band members with Harry and Matt Freebre taking up the Gallagher role of the band as song-writing brothers, whilst Sheepey (Sam Richards) joins Harry as a co-frontman. The remainder of the band consists of Lloyd Brown (bassist) and Danial Owen (keyboards), but they were unfortunately unable to attend the interview at the renowned Courtyard pub in central Manchester last Tuesday. NQ: The Steak Baguettes is an interesting name. How’d you guys come up with that one? HF: The name of the band came about when we were queuing at a food stall at T in the Park called the Butcher’s Grill. There was a girl there who we talked into buying a steak baguette instead of a hot dog. SR: We then said to ourselves that we start a band called ‘The Steak Baguettes’. MF: I’m still not 100% on the name, we are trying to move away from the comical side of things and this doesn’t do us any favours. NQ: How did you guys all meet? HF: We don’t actually know each other. We just meet together sporadically when we have to. MF: No, that’s not right. I’ve been friends with Sheepy for about seven to eight years, and Harry is my brother. NQ: So, why did you decide to start a band? MF: Because we’re incredibly talented. HF: I second that. We are incredible. SR: This is the worst interview I’ve ever been in, do you call yourself a journalist? NQ: Moving on. Harry, you’re a chairman of a football club. How did that happen? HF: (in a monotone mock accent) Yes, I am indeed chairman of a football club. NQ: This is interview will be a reflection of you, enough of the accents, please guys. HF: Why, are you going to write down the accent I said it in? NQ: C’mon, give me something here. How’d did you end up being a chairman of a football club? HF: I am chairman of the board of Harlech Town football club under no reason whatsoever. They just needed a name to write down as chairman, so I put myself forward. NQ: And you guys raised over £1000 for the club? 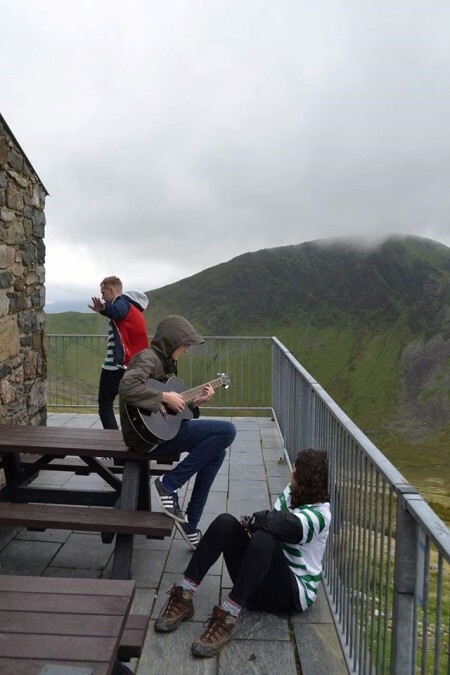 SR: For the club, we played a gig on top of Mount Snowdon. We raised over a £1000 by knocking on doors and asking for money. It took about three weeks. HF: We thought we’d raise about £50 initially. NQ: You raised money for the club, does it have financial problems? HF: All non-league football teams have financial problems. MF: It’s a local side. In fact Sheepey played for the club for a whole season up front and didn’t score a single goal. SR: But I had three assists and scored a hat-trick pre-season. NQ: Are you guys hoping to move away from the comedic elements of your music? HF: Yes, away from comedy and moving onto creating the best album that’s ever been called ‘That’s Gotta Be’ by the Steak Baguettes. SR: That’s a world exclusive you’ve got there, pal. NQ: Are you happy with ‘The Joke That Went Too Far’ EP? HF: It was a world beater. MF: Remember how the first Velvet Underground album didn’t sell very well? Well they that said that everyone who bought that album went on to form a band. It’s just like that. It’s going to a cult classic. NQ: You released the song ‘Do you know who Eric Bischoff is?' What’s your attachment to WWE wrestling? HF: We just don’t know who he is, that’s why we’re asking. Do you know who he is? SR: Yeah, do you know who he is, Jacque? NQ: I’m asking the questions, but something to do with wrestling? HF: We don’t know, we’re just trying to find out, that’s why we did the song. NQ: So you guys don’t have a favourite wrestler? SR: IT DOSEN’T MATTER WHAT YOUR NAME IS! HF: You’re going off topic here, Jacque. C’mon, try and bring it back. NQ: What band inspires you the most? MF: The Beatles. No one has bettered them in the last 250 years. Actually, maybe ever. HF: No one apart from the Steak Baguettes. But I do actually think music is the worst it’s ever been. MF: There’s a lot of underground stuff which is really good. Then there’s crap like that Dubstep. HF: Dubstep really doesn’t have a lot of charm. MF: Whatever is in the charts is usually terrible. If I could write a hook half as good as ‘Lola’ by the Kinks, I’d be happy. NQ: Can the music industry change? Can it improve? MF: No, it can’t. Never. It’s gone. HF: Music is too formulaic for anything to change. SR: It needs to have meaning. HF: Yes, that’s why a lot of what we’ve written in the new album has quite a political hinge to it…attacking anything we don’t agree with. Like this terrible interview, we could write a song about that. SR: And we could call it Jacque Talbot.